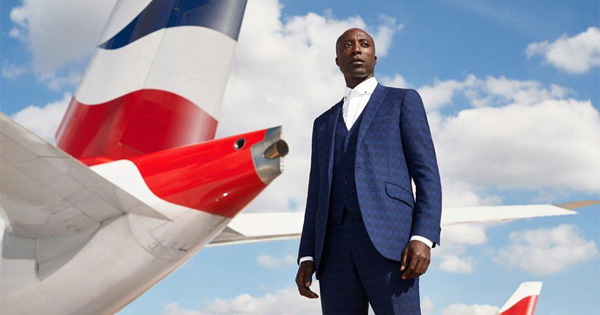 Ozwald Boateng, a renowned African-British fashion designer, has been chosen by British Airways, one of the largest airlines in the world and the flag carrier of the United Kingdom, to design new uniforms for their 32,000 employees. The prestigious airline, which will be having their centennial anniversary in 2019, will highlight Ozwald's design of the new uniforms during the celebration. "I am really excited about creating this new uniform for British Airways. It is important for me to create something that makes all of British Airways' 32,000 uniform-wearing employees across the world excited, at the same time as enabling me to really demonstrate my skills as a designer," Ozwald said in connection to his recent project with British Airways. The uniforms that Ozwald will design will be a part of British Airways' £4.5 billion investment for the next five years. The airline's chairman and chief executive, Alex Cruz, noted that the "uniforms have been an iconic symbol of our brand throughout our 100-year history and our partnership with Ozwald will take us forward to the next chapter in our journey." Born in London to Ghanaian parents who immigrated to the United Kingdom in the 1950's, Ozwald was just 14-years old when his love for fashion became evident after working for a summer job where he sewed linings into suits. Recognizing that the signs for his future career had been around him all along, he started working on his mother's sewing machine to create his first collection. Now, he is an award-winning fashion designer that creates signature designs with classic twists and styles that are admired by a lot of fashion enthusiasts. Just last year, he won the "Impact in Fashion Award" at the Ghana Legacy Honors in Accra.